As the effects of climate change become more prominent in the daily lives of Americans, businesses must begin to consider ways to increase the resilience of their operations, while governments must consider legal frameworks to foster development and operations that will be resilient to the impacts of unpredictable and changing climatic conditions. Identifying adaptation opportunities and planning for climate change-related impacts can be a wide-ranging and intricate process. For example, slow-onset events associated with climate change (such as drought and sea-level rise) present different adaptation challenges than rapid-onset events (such as floods, hurricanes, and wildfires). Potential adaptation measures intended to increase resilience may be difficult to justify due to uncertainties of how and when climate change impacts will occur and, thus, can be difficult for business and governmental decision-makers to authorize and fund. The search for funding or financing for costly and complex climate change adaption measures may intersect with policy developments in the arenas of greenhouse gas regulation, carbon markets, and environmental mitigation, as well as the development of standards of practice for adaptation measures. Van Ness Feldman’s attorneys, technical, planning and policy professionals provide a full suite of policy, regulatory, project development, permitting, transactional, and strategic services to a diverse cross-section of clients and industries. Van Ness Feldman combines its strong experience in crisis planning and preparedness, legal services, code and policy drafting, government relations, thought-leadership, and policy strategy. VNF’s team of professionals has in-depth knowledge and operational experience across the full range of climate-related hazards and brings exceptional capabilities in both risk assessment and risk management counsel. As strategic advisors to senior officials of government, utilities, private companies, and not-for-profit organizations, the firm is highly-skilled at examining the most significant policy, planning, and response challenges. VNF professionals employ the breadth and depth of their expertise to practice and serve as thought-leaders at the intersection of mitigation and adaptation and can assist clients in meeting their business goals in a cost-effective manner. As warming water expands, glaciers melt, and storm severity increases, coasts are experiencing the increased flooding and inundation of sea level rise. Coastal lifelines, such as water supply, energy infrastructure, and evacuation routes, are increasingly vulnerable to higher sea levels and storm surges, inland flooding, erosion, and other climate-related changes. An assessment of risks to coastal impacts of climate change is the first step in becoming resilient and is increasingly the industry standard to predict and adapt to the impacts of climate change. Assessments are unique to location, uses, and possible implementation of adaptation measures. Real estate investors, utilities, and regulators may require assessments and disclosures of vulnerability of property to climate change. Van Ness Feldman professionals assist clients with assessments, environmental, planning, and permitting matters related to regulation of flood plain management and construction of adaptation measures. Van Ness Feldman’s resilience team can assist clients with any and all required disclosures to investors or buyers, insurance, and related purchase and sale transactions, and can assist with the planning, policy development, and funding related to potential relocations. See VNF’s Practice: Real Estate & Land Use. Climate change has exacerbated both the number and intensity of droughts, heavy rains, fires, and storm events. In the past year alone, Hurricanes Harvey and Irma caused an estimated $150-200 billion in damage in the United States; damages from Hurricane Maria are estimated over $90 billion with Puerto Rico struggling to recover dependable utility service after 8 months; the over 80 wildfires in the western United States caused over $1.75 billion in damage; and an extreme heat wave in California left many without power. Dealing with impacts from extreme weather requires a two fold approach—preparedness and response. Municipalities, corporations, and private citizens all face impacts from extreme weather events and each possess unique legal hurdles in preparing and responding to impacts. Van Ness Feldman professionals are experienced in counseling diverse entities on all risks associated with extreme events and is particularly sought after to provide representation and assistance with disaster recovery as a part of VNF Solutions, LLC. See VNF Solutions. Over the last several decades, the United States has experienced increased incidents of flooding and related storm events. These events affect coastal areas, where sea level rise, subsidence and storm risk have increased the intensity and effect of flooding, as well as inland areas, where accelerated snow melt and increased stormwater runoff has caused rivers to more frequently crest their banks and flood surrounding communities. It seems that no area of the country is exempt from these evolving processes. Recent examples include the continuous subsidence and erosion of the Louisiana coastline, which was exacerbated by the Deepwater Horizon oil spill, and the increased inland flooding on several rivers in Western Washington such as the White River and Puyallup River. All indications are that these flood risks will continue to expand in intensity, duration and geographic scale, increasing the need for both preparation and recovery actions. Professionals at Van Ness Feldman are prepared to assist their clients both in preparing for and responding to increased flood risk and flood events. We assist both public and private clients in understanding their current flood risk and determining their future risk; understanding the evolving regulatory environment, in which improving and modifying properties (including minor grading projects) within the floodplain is becoming more difficult and time consuming; and implementing on-the-ground changes to operations and improvements to reduce flood risk and increase resiliency. We frequently work with property owners and local jurisdictions to develop long term, comprehensive plans for their properties that address and balance reducing flood risk with improving habitat for aquatic species to ensure an environment that works for all. See VNF's Practice: Water Quality, Wetlands, & Floodplains. As sea levels rise, melting permafrost, and extreme weather make land inhabitable, many populations will become displaced. In Alaska, several communities face forced relocation from their historic lands due to a combination of the aforementioned factors. At our nation’s southern tip, over 30,000 Houston residents were served in emergency shelters due to Hurricane Harvey after homes were swept away or too severely damaged to prove habitable. Preliminary data suggest unprecedented migration from Puerto Rico to the mainland United States in the wake of Hurricane Maria, with up to 179,000 Puerto Ricans fleeing the island. Quite literally, people will migrate to better and safer climates with one study estimating that 13 million people will be displaced by sea-level rise by the year 2100. Whether it be a family of four migrating from Houston to San Diego, or an entire Alaskan Village moving upland, climate migration presents several legal challenges from property values to zoning. Van Ness Feldman professionals are well versed in the potential legal impacts of climate migration having over 40 years’ experience representing Alaska Native Corporations and others with real estate and land use issues nationwide. See VNF’s Practice: Native Affairs. Van Ness Feldman’s resilience team can assist clients with any and all required disclosures to investors or buyers, insurance, and related purchase and sale transactions, and can assist with the planning, policy development, and funding related to potential relocations. See VNF’s Practice: Real Estate & Land Use. As the ocean absorbs carbon dioxide (CO2) from the atmosphere, seawater becomes more acidic and the carbonate ions, necessary to build and maintain shells for organisms such as oysters, clams, sea urchins, shallow water corals, deep sea corals, and calcareous plankton, become relatively less abundant. With ocean acidification affecting the entire planet’s oceans, including coastal estuaries, and waterways, the ocean science community, resource managers, commercial fishing industry, federal and state policy makers, and the public are now coordinating research. VNF’s resilience team is able to integrate into client operations to maximize understanding and communication about future policy and funding to mitigation. Van Ness Feldman professionals are particularly sought after to provide representation and assistance in the integration of science and policy as a part of VNF Solutions, LLC. See VNF Solutions. Climate change will impact the quality of water in our streams, rivers, lakes, oceans, and aquifers in a variety of ways. Low flows under drought conditions can degrade water quality. On the flip side, high flows during extreme rainfall events, along with the effects of wildfires, can increase the amount of sediment, nutrient and contamination loads flowing into water supplies and can overwhelm sewer systems and water treatment plants, which may also be threatened by sea level rise. As the sea rises, saltwater intrudes into freshwater aquifers, contaminating drinking water sources. Drought can also cause coastal water resources to become more saline as freshwater supplies from rivers are reduced. Van Ness Feldman professionals can assist water utilities, municipalities, developers, and other stakeholders in preparing for and adapting to water quality impacts. Preparation typically begins with a risk assessment tailored to entity’s particular industry and organizational model. With a comprehensive assessment in hand, the entity can evaluate strengths, weaknesses, and options for potential changes in areas such as soft and hard infrastructure, institutional capacity, and outreach and education. For example, most water utilities face complex decisions about water capture, storage, and reuse options, which have implications for water quality as well as water supplies, and some utilities will make decisions about how much to invest in source-protection strategies versus water treatment and recycling technologies. Van Ness Feldman professionals help clients weigh these kinds of options in light of the current and likely future regulatory and policy framework surrounding climate-induced water quality impacts. In addition to planning and preparing for the future, Van Ness Feldman also helps clients implement changes related to climate-induced water quality impacts, including negotiating and drafting agreements related to hard infrastructure, complying with changing regulatory requirements, and seeking legislative changes. With focused expertise at the intersection of regulatory compliance, policy insight, and complex transactions, Van Ness Feldman’s professionals stand ready to assist with the wide variety of steps our clients are taking to become more resilient to such impacts. See VNF's Practice: Water Quality, Wetlands, & Floodplains. Van Ness Feldman professionals are prepared to assist clients with understanding potential legal impacts from water supply risks and integrating these considerations into planning, transactions, and regulatory compliance. See VNF’s Practice: Water Resources. Van Ness Feldman professionals are experienced in counseling local governments and water utilities on water supply management, including water system planning and risk assessments of water supply contracts. In the private sector, Van Ness Feldman has counseled clients in numerous industries including hydropower, agriculture, manufacturing, and real estate development, on planning, environmental, and permitting matters related to water supply management. The future of global food security will depend on the adaptation and resilience of agricultural systems to climate change. Agriculture is deeply interconnected with weather and climate, which are the main drivers of agricultural production and also the dominant factors in the overall variability of food production. From the perspective of individual producers, climate change presents risks ranging from increased “input” costs and decreased “output” prices to degradation of critical soil and water assets, weather shocks, plant pests, invasive species, and animal diseases. From the perspective of local communities seeking to build resilient agricultural systems, the risks are broader: they include things like increased food prices for consumers, reduced availability of food, and local or regional food insecurity. Van Ness Feldman professionals can assist agricultural landowners and producers, local governments, and other stakeholders become more resilient by preparing for and adapting to these risks. We have deep expertise in the land use, planning, zoning, and environmental issues surrounding agriculture, water rights, and climate change. We also offer services such as comprehensive risk assessments, targeted evaluations of water right portfolios, assistance with securing federal funding for agricultural energy projects, and representation in carbon credit sales and other transactions. Climate change will impact terrestrial and aquatic species and their habitats in many different and uncertain ways. Understanding and responding to these impacts will create new challenges for federal, state, tribal and local governmental entities, which have roles in species and habitat management and protection. These potential and uncertain impacts also create new regulatory challenges for clients with existing and proposed projects that may affect terrestrial and aquatic species and/or their habitats. With one of the most well-regarded natural resource practices in the nation, Van Ness Feldman is uniquely qualified to advise public and private clients on responding to these challenges. The firm has extensive experience working for both public and private entities on species and ecosystem management issues. The firm has broad knowledge across the breadth of regulations that govern this space and are well prepared to assist clients in complying with and interpreting laws ranging from local land use development regulations to federal statutes such as the Endangered Species Act and the National Environmental Policy Act. See VNF’s Practice: Endangered Species and Public Lands. Forests are connected to climate change in a complex variety of ways. A changing climate increases the vulnerability of forests to ecosystem changes and tree mortality through insect and disease outbreaks, fires, and drought. Climate changes affect the growth and productivity of forests through changes in temperature, rainfall, weather, and other factors. Those vulnerable forests capture and convert carbon dioxide into oxygen and carbohydrates, making forests and associated wood products the original clean air and carbon storage climate change mitigation. 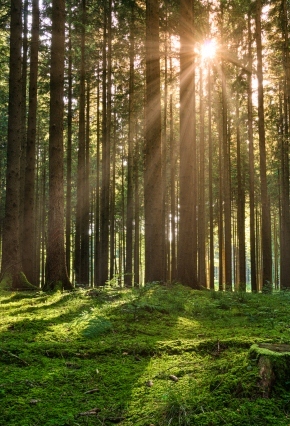 In addition to clean air and carbon storage, America's forest ecosystems provide many benefits, including clean water, recreation, biodiversity, wildlife habitat, climate regulation particularly in urban settings, a variety of forest products and resources for bioenergy production (the use of plant based materials for energy production. ) Accordingly, forests will be a critical piece of any comprehensive strategy for maintaining resiliency in the face of climate change. Van Ness Feldman professionals can assist forest landowners, local governments, and other stakeholders become more resilient by preparing for and adapting to these changes. We have deep expertise in the land use, planning, zoning, and environmental issues surrounding timberlands, forestry, and climate change. We also offer services such as comprehensive risk assessments, assistance with securing funding for projects to enhance forest resilience, and representation in carbon credit sales and other transactions. Climate change threatens human health and well-being in many ways, including impacts from increased extreme weather events that affect availability of shelter and utilities, wildfire, decreased air quality, increased allergic response, temperature extremes, illnesses transmitted by food, water, and disease-carriers such as mosquitoes and ticks, and food insecurity. Without adaptive actions, climate change may, absent other changes, amplify some of these existing health threats. Certain people and communities are especially vulnerable, including children, the elderly, the sick, and the poor. Public health actions, especially preparedness and prevention, can do much to protect people from some of the impacts of climate change. Van Ness Feldman professionals can identify and plan for actions that will reduce health impacts of climate change such as reducing urban heat islands, establishing tree ordinances for improved air quality, , creating fire zones and ordinances to reduce wild fire risk, and funding and planning for community cooling centers for vulnerable populations. See VNF’s Practice: Real Estate & Land Use. Municipalities across the country are on the front lines of four related challenges: increasing extreme events, aging and deteriorating infrastructure, fiscal pressures at the state and local level, and ongoing economic uncertainty. In the face of these challenges, city, county and regional governments must work to make their communities more resilient. For municipalities, resilience means the ability to anticipate and reduce risks, to absorb and respond to disruptions, and to recover and adapt their physical, social and economic systems. Comprehensive plans, land use regulations, and building codes can develop a built environment that is more resilient to the local and regional effects of climate change. Capital projects and infrastructure can be designed and maintained based on forward looking climate data and enhanced natural systems. Utilities can be managed to take advantage of technological advancements to anticipate risks and minimize service disruptions. Economic development and public private partnerships can encourage local economies that are more diverse and adaptable. Emergency management and response can be expanded to include post-event recovery plans, policies and procedures. Van Ness Feldman’s diverse practice areas offer municipalities a deep and broad range of resiliency solutions to these challenges. Our work for municipal clients includes extensive land use, infrastructure, utility, energy, and environmental experience at the local, state and federal levels. Combined with the perspective that we have gained from our private sector and institutional clients, our attorneys, policy professionals and land use planners can assess risks, propose responses, identify partners, and leverage resources for municipalities. See VNF’s Practice: Real Estate & Land Use. Extreme weather events such as hurricanes and heavy rainfall accompanied by flooding, impact real estate in an immediate manner. Potential climate change impacts (such as those described in Coasts and Sea Level Rise) with accompanied increase flooding, or temperature increases and risk of inadequate water supply, are increasingly considered in decisions to invest or divest in real estate. As part of risk management of a real estate portfolio, the long term value of investments and the cost of development must be carefully considered, and appropriate disclosures made. With in-depth knowledge of clients’ operations and experience across the full range of hazards, Van Ness Feldman professionals bring exceptional capabilities in risk assessment and risk management techniques. Van Ness Feldman professionals can assist clients with planning, environmental, and permitting matters related to changing regulation and construction of adaptation measures; with any required disclosures to investors or buyers, or insurers; with purchase and sale transactions; and with the planning, policy development and funding related to relocations. See VNF’s Practice: Real Estate & Land Use. The effects of a changing climate include increased weather events such as heavy rain, hurricanes, tornadoes, and floods. These events destroy any and all forms of property including homes, cars, businesses, and crops which leads to an inevitable increase in the number and severity of insurance claims. As a result, insurers in some parts of the country have stopped offering certain types of insurance coverage and many insurers have limited the types of coverage they offer or with higher insurance premiums. See VNF’s Practice: Water Quality, Wetlands, & Floodplains. However, the insurance industry is working to encourage more coordination among governments, policy makers, standard-setting bodies, and regulators to address barriers to insurers scaling up their contributions to climate adaptation. Similar to the role the insurance industry played in responding to property contamination in a manner that now drives hazardous materials handling, the insurance industry may institutionalize climate change as a core business issue and expand its contribution toward building financial resilience to climate risk. The Financial Stability Board established an industry-led task force: the Task Force on Climate-related Financial Disclosures (TCDF) to develop voluntary, consistent climate-related financial disclosures that would be useful to investors, lenders, and insurance underwriters in understanding material risks. Over 250 organizations have expressed support for TCDF. With in-depth knowledge of clients’ operations, and experience across the full-range of hazards, Van Ness Feldman professionals bring exceptional capabilities in risk assessment and risk management techniques. As strategic advisors to senior officials across all levels of government, utilities, not-for-profit organizations, and global corporations, the firm assists clients in examining their most significant policy, planning, and response challenges. VNF’s governmental relations team provides counsel on policy efforts with the insurers, funding, and other policy and legislative efforts. See VNF’s Practices: Real Estate & Land Use and General Counsel. Climate change is already causing costly impacts to the transportation systems, with roads, bridges, rail systems, and the vehicles that use them being damaged by severe precipitation events, hail, and flooding in recent years. In the coming decades, all regions and modes of transportation will be affected by increasing temperatures, more extreme weather events, and changes in precipitation. Some infrastructure will be impacted by rising sea levels, particularly along seacoasts and in Alaska. With expertise in the laws, regulations, and policies surrounding both transportation systems and climate change, Van Ness Feldman professionals are in a unique position to help clients think strategically about transportation impacts so they can prepare for and adapt to them. For example, cities, counties, and other local governments engaging in comprehensive land use planning need to anticipate these kinds of impacts and incorporate resilience strategies into their plans. Developers of residential, commercial, industrial, and other types of projects need to account for them in their project plans, environmental review documents, and financial strategies. Transit agencies need to build resilience into the infrastructure they are building today. Van Ness Feldman professionals can help clients like these become more resilient to transportation-related impacts that climate change will bring in the near future. Cities have emerged as leaders in adaptation and resiliency efforts. This should not be surprising, since efficiently planned and effectively managed cities are a significant solution to climate change through reduced greenhouse gas emissions from buildings, transportation, and infrastructure. Cities are being forced to anticipate, respond to, and recover from the disruptive, damaging and tragic impacts of climate change, with the recent examples of Houston (Hurricane Harvey), New York (Superstorm Sandy) and New Orleans (Hurricane Katrina). See Extreme Events. However, efforts to adapt and increase resilience are now expanding to the private sector. Since 2016, Urban Land Institute’s annual Emerging Trends in Real Estate survey of property owners, developers, investors, and others involved in real estate has included climate change as a top trend. Major multinational companies are preparing for climate change impacts, to both avoid disruption and take advantage of new economic opportunities, and often their actions extend down their supply chains to smaller companies. See Risk Management: Insurance and Disclosures. The intersection of these public and private sector resiliency efforts will occur in urban areas, which will become fertile ground for innovation. This will result in both opportunities and challenges, and it will require new perspectives. New development and redevelopment will be designed and constructed based on new plans, regulations and codes designed to increase resiliency. Industry will be required to minimize climate impacts and withstand extreme events. Energy systems will be more distributed and focused on storage. Transportation will be more automated and less carbon based. The infrastructure to support these innovations will be constructed based on forward looking climate data, will use enhanced natural systems, and will be financed with new tools and partnerships. Van Ness Feldman prides itself on our representation of both public and private sector clients in all of our practice areas, including land use, real estate, environment, energy, transportation, infrastructure, disaster recovery, financing, and tax policy. This range of experience gives us a unique perspective on risks and solutions to resiliency of urban areas, including the abilities to navigate complex land use and environmental regulations, to develop public-private partnerships, to create unique financing approaches for complex projects, and to navigate the complicated and ever-evolving world of federal funding. See VNF’s Practice: Real Estate & Land Use.